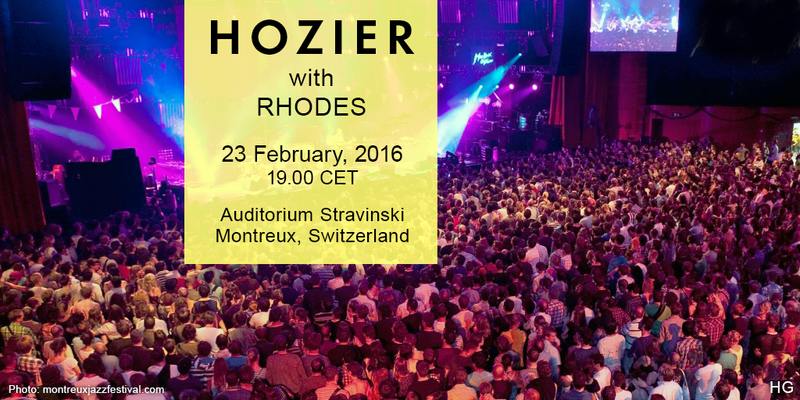 Hozier played the Auditorium Stravinski in Montreux, Switzerland on Tuesday, 23 February, 2016. Rhodes opened. Capacity 3,500. Hozier and the band took advantage of a day off in Montreux to explore. The statue dedicated to Freddie Mercury on the shore of Lake Geneva. Hozier recieved a very nice souvenir from Switzerland. Maty (Lights) and Gavin (Sound) at soundcheck. Full-length It Will Come Back here. The call and response in Montreux was, well, disappointing. But Hozier’s response was hilarious. Hozier had a few problems with his band and crew introductions in Montreux. He also acknowledged his crew who had been nominated for TPi Awards with Jake Ryan winning Tour Manager of the Year. There’s our Murt in the background, working on Honey the vintage Harmony H78. Tagged auditorium stravinski, montreux, Rhodes, switzerland. Bookmark the permalink.